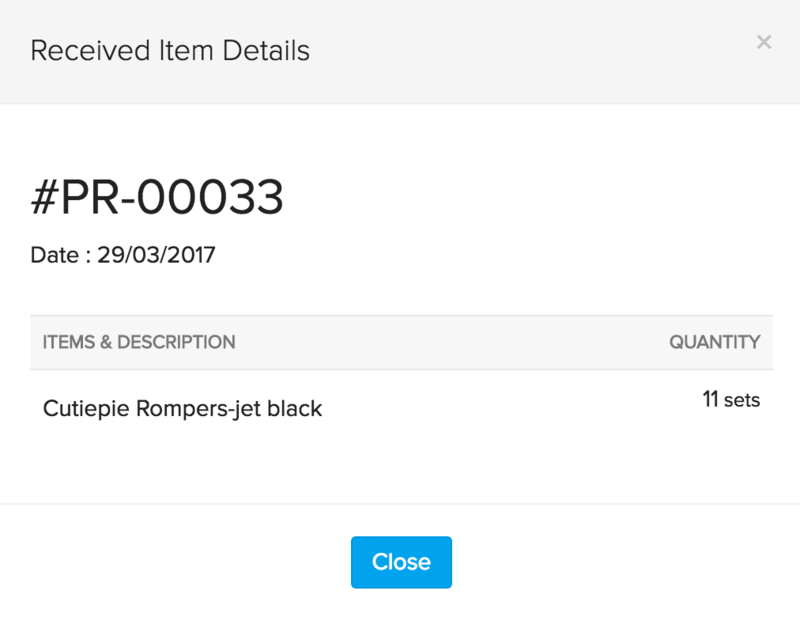 A purchase receive or simply Receive in Zoho Inventory is a document to record the items delivered by your vendor to your warehouses. This is your way of recording the items and delivery notes you have received from your vendors for the purchases made by you. You can keep track of the items you receive from your vendors. You can convert receives to bills and thereby raise bills only for the items that you have received. You can also calculate the stock on hand of an item based on purchase receives. Select the preferred purchase order. You can either click on the New Purchase Receive option or you can click on the Receive All button and choose an option from the drop-down. 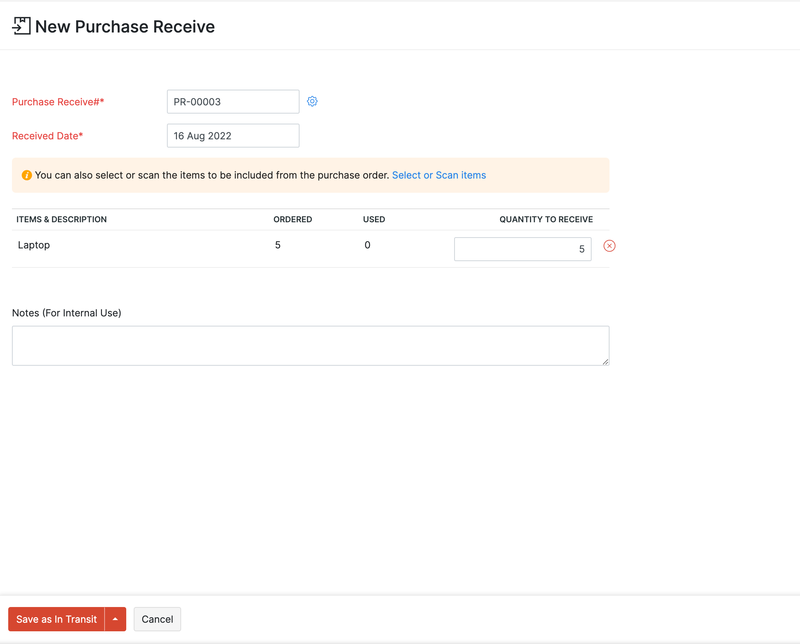 Pro Tip: You can partially or fully receive the items in a purchase order by choosing the respective option(Receive All or Partial Receive option) from the Receive All drop-down. A New Purchase Receive page opens up. Configure the items the quantity to receive. Pro Tip: Enable the Select/Scan items option to scan the barcodes or manually add the items from the dropdown. Click on the Receive button to proceed. Insight: At the moment of saving, only the items selected in the current state of Select/Scan items toggle will be added to the new purchase receive. Purchase receives can only be created from a purchase order. Select the preferred purchase order and open it up. Go to the Receives section on top. Here you can find the receive(s) created for this purchase order. Click on the Convert to Bill option that is available at the right end of the receive. 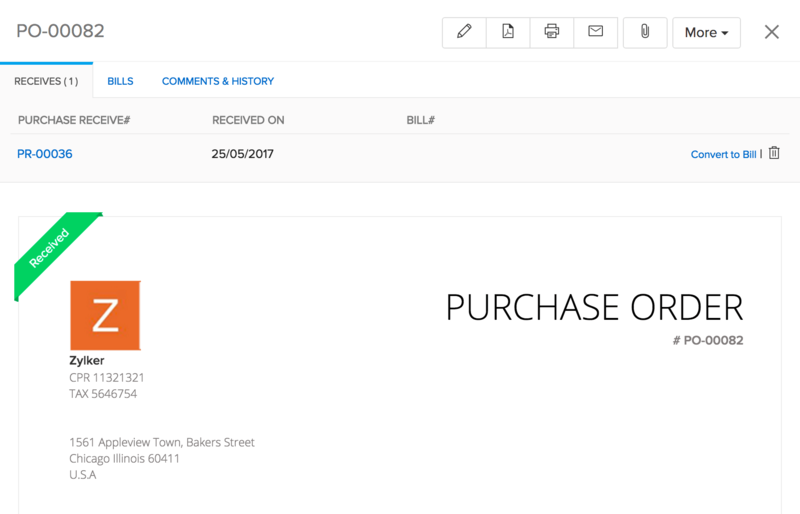 A New Bill page opens up along with all the details automatically fetched from the receive. Fill up the remaining necessary details like bill number etc. Click on the Save button to convert the receive to a bill. Select the preferred purchase order and open it. Click on either of the buttons(New Purchase Receive or any one of the options in the dropdown of the Receive All button) as shown in the screen shot below. 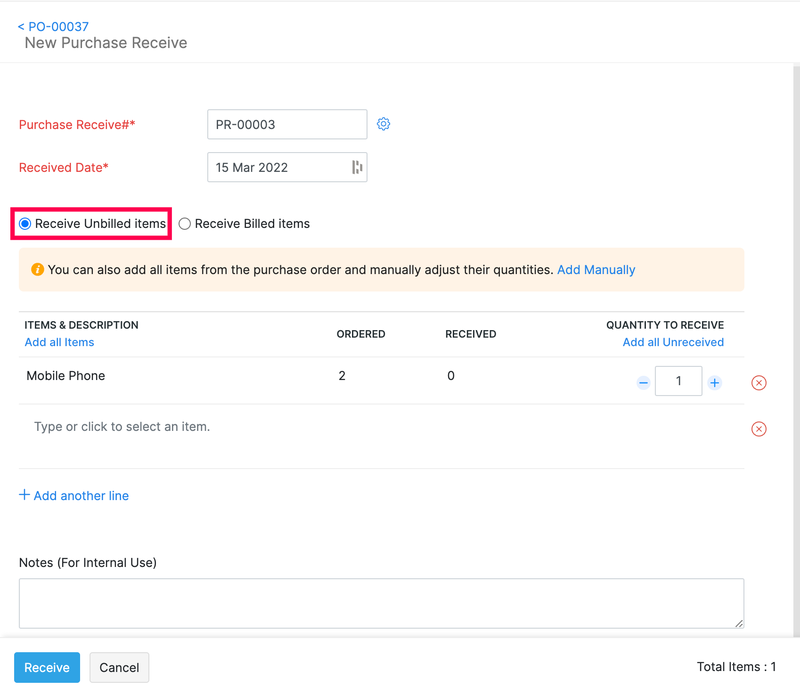 In the new purchase receive page, you can create receives for the unbilled items and billed items separately. 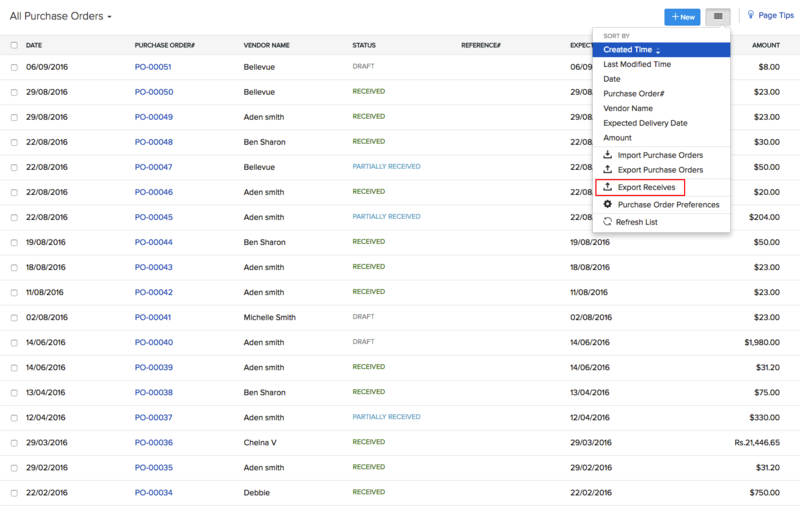 The Receive Unbilled items option lists all the items from the purchase order that haven’t been billed and that you are yet to receive from your vendor. 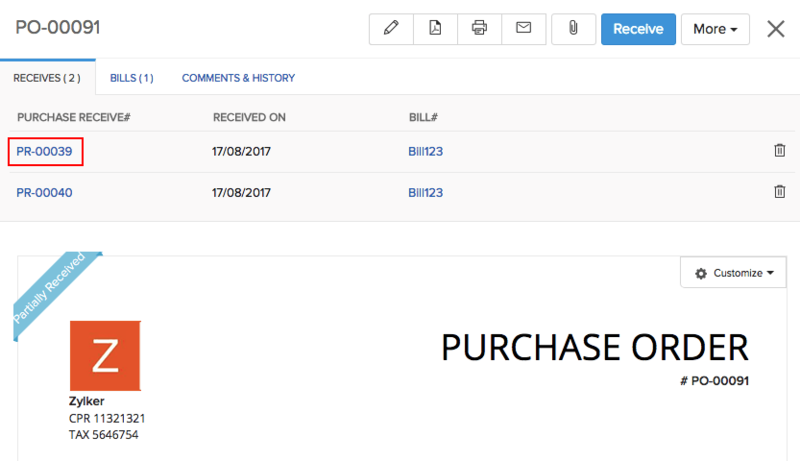 The Receive Billed items option lists all the bills associated with the purchase order for which no purchase receives have been made. Retain the bills for which you would like to record a receive. Expand the bills to get a glance of the items in the bill. 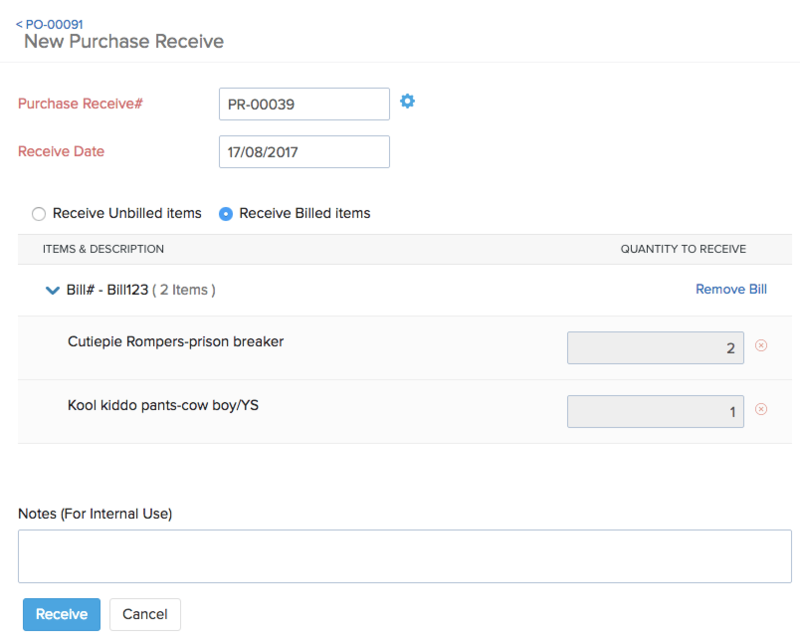 You can even configure the items in the bills for which you’d like to record a receive. Insight: The Select/Scan items option is not applicable here as you cannot manually add the bills. Finally, click on the Receive button to proceed. You can find the Purchase Receive number and the bills associated with the receive under the Receives section. 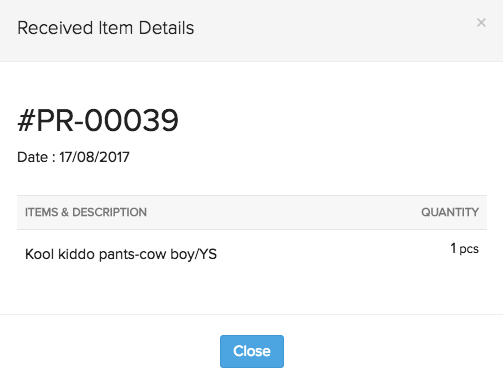 Upon clicking the Purchase Receive number, a pop-up window opens with the details of the received items. Click on the Purchase Orders module from the left hand side bar. In the Purchase Orders page, click on the hamburger menu (three horizontal lines) button. Select Export Receives to export the purchase receives to your required format.